UPDATED 5/30! Check out the end. Corky's is a unique place. Off the 210 out in the sticks of Rancho Cucamonga, it is a locally owned and newly opened 24-hour diner. I've been to Corky's several times now: breakfast and dinner and late night hungry time. According to a waitress I spoke to, the owner saw the need for a good home cooking place to compete with Denny's. Corky's has a lot going for it. Convenient location... I mean relatively. Clearly not convenient if you live in Santa Monica or...well anywhere other than Rancho Cucamonga. It is right off the 210 though, so on your way to or back from Vegas, it would be right there. It has wonderful homey decor. It looks like what you wish your grandmother's house looked like, instead of a pine box in the ground...or maybe that's just me. They bake their cookies and pie right there. It has just one problem: the food is pretty, but taste-wise can only be described as "meh." Antoinette got the Pea Soup in a bread bowl. Some people can't stand pea soup, sometimes because of the "Exorcist," sometimes because it's kind of gross in theory. It's peas...mushed up...and made soupy. We both appreciated that that they included the scooped out piece of bread as a "sopper" and the soup itself wasn't half bad. So overall this trip was mediocre at best. I really wanted some dumplings with my chicken. That would have been really nice. A busy Sunday morning found us again at Corky's counter for breakfast. Sitting there, we were able to see some of the whirling dancing of the waitresses. A half dozen waitresses were busy shuffling around orders, slathering butter on toast, TWICE,once before it goes in the toaster and once after. I wasn't all that hungry, so I ordered the oatmeal. That's a lot of good fixings for oatmeal, which is great because you definitely need them; the oatmeal was mushy and bland. Waitress 1 to pregnant waitress: How are you holding up? I was so horny when I was pregnant. Antoinette got the eggs breakfast, the home fries were overly salty. The eggs were adequate. On our first trip there, I ordered the Meat Loaf Sandwich. The meatloaf was too moist and tasted like meaty water. It also had green peppers, which overpowered the dish entirely. The rest of the food was, well..... "meh." The one saving grace for Corky's is their pie. Apple pie, thin crust and packed full of apples that still taste like apples and not apple pie filling. Eggnog Cream Pie. I love eggnog. Even without booze, I love eggnog. Now put it in pie form? That is good eating. I don't give a damn if it's near Christmas or not. I am firmly Pro-Eggnog. Chocolate cream pie that had a smooth chocolate flavor with the only flaw being a rather bland crust that tasted like a store bought frozen one. 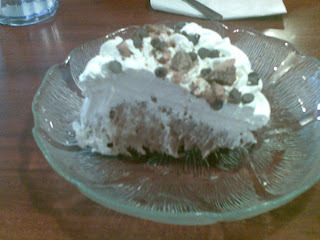 German chocolate cream pie that was nearly s good as House of Pies. And pumpkin pie that just punched your mom's pumpkin pie in the face. I cannot, in good faith, recommend Corky's for anything other than these delicious pies. The food looks so good. It's presented beautifully, but it just fails to deliver on taste. A few weeks ago I received a very nice email from Mike, the owner of Corky's. He apologized that we hadn't been completely satisfied with our food and asked us if we would come back and give them another try. Trusted Official #1 Diner Companion, Antoinette, and I went back there last week. 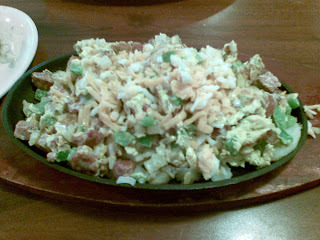 I had the Polish Sausage Skillet and it was freakin' delicious. Best way to describe it was "fresh." 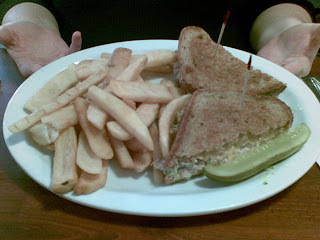 Antoinette had the tuna melt on wheat, which was also good. The best thing though, and I knew it would be, the new Mocha Toffee Swirl Cream Pie. Go call your mom and tell her that everything she's ever done for you has mattered not one goddamn bit because she never made you this pie. This pie is simply amazing. So now I'll say, enthusiastically: try out Corky's. Wait. You can butter toast before it goes in the toaster? This new information both blows my mind and will change my life. My wife and I *love* Corky's and are quite sad that our favorite place to eat is now just too far away since we moved. 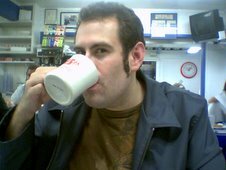 Whenever we couldn't decide what to cook, or simply were too tired to do so, we'd drive the block or three down to Corky's. They were a bit hit and miss when they moved locations, but they found their groove. Great place any time of day!